The Fairings we sell Batwing, Bullet and Cafe are Clear Lexan that has been painted by the Manufacture "Gloss Black" in the INSIDE of the Fairing so it looks Black on the outside. 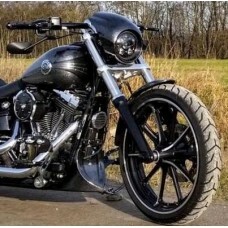 This is perfect for a Riding Season if you want a Gloss Black Fairing, as your Fairing will get road rash, rocks, dust, bugs and debrix hitting it all Riding Season! So at the end of the season you can get it painted or do it before and your done. 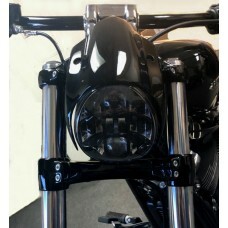 The Roadster and One Shot Fairings are ABS Plastic and come a dull black but can be painted to match your bike. We get these questions all the time, so we have some answers for you! apple, whatever you are more comfortable with. your arms that determines what size you may need. some rain and it may be a problem looking through the shield. yardstick taped to the headlight or have another person hold the yardstick for you. 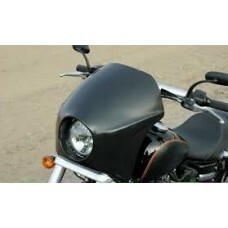 "Breakout Headlight Cowl" KitSince HD raised the price on these AGAIN! We are in the process of..
Dyna "One Shot" Fairing Made Specifically for Dyna's this Fairing is Mounted to the Fo..
M8 "Aggressor" Breakout CowlAggressive look and Unique style is all that you need for your New Harle..
New! 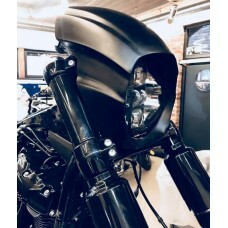 "Breakout" Headlight HoodMade for the "Milwaukee Eight" Breakouts2018 & Up.This is a very p..